It’s not a surprise at this point that Star Wars: The Last Jedi is a divisive film. While it has so far made over $1.3 billion dollars worldwide, there are still people out there that consider this movie a massive failure. You cannot deny that box office wise The Last Jedi has surpassed all expectations. However, Rian Johnson’s take on the Star Wars story has left fans scratching their heads. 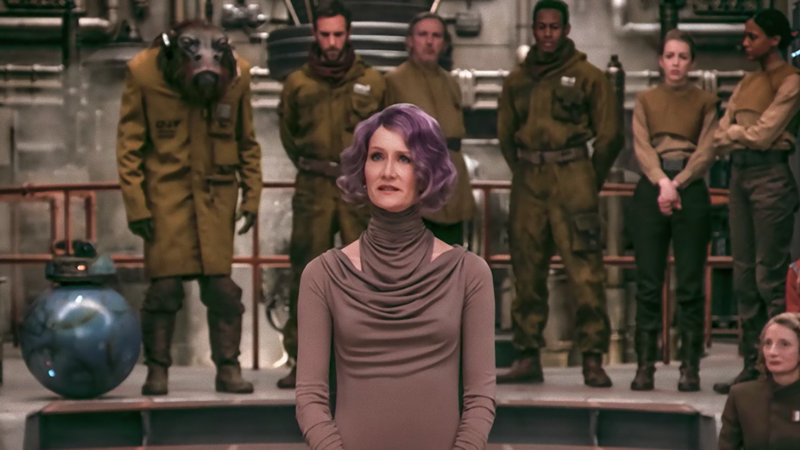 One of the big criticisms I’m hearing all over the internet is the belief that Laura Dern’s character Vice Admiral Holdo should have told Poe Dameron the escape plan before he begins his mutiny. Before all of you start screaming at your computer, let me ask you all a question: Why should she have told Poe the plans in the first place? If you’re still confused or angry allow me to explain. First off, Holdo clearly doesn’t know who Poe is. All she knows of him is that Poe is General Leia’s trusted X-Wing pilot who recently demoted him. The greatest Resistance pilot there ever was, was also the man responsible for many of the deaths at the beginning of the movie. Poe went against Leia’s orders to retreat and it cost them not only some of the few remaining X-Wing pilots but also the entire and I repeat the entire Resistance bombing squad. All six of those MG-100 bombers were depleted including Rose Tico’s sister Paige who perished after successfully releasing the proton bombs that destroyed the First Order’s Mandator IV-class Siege Dreadnought aka the Fulminatrix. Though Poe and his crew were successful in taking out the Dreadnought, many Resistance lives were lost in the process and could have been avoided had Poe listened to General Leia’s orders. Poe became too trigger happy while having a passion to constantly jump in an X-Wing and “blow something up.” It’s not until the end of the movie when he finally realizes that sometimes you just have to retreat and fight another day. The Last Jedi appears to have a similar situation here where fans hear one thing, and often reiterate it in a close but different way. The scene I’m referring to here is the dialogue that is spoken to Rey by Kylo Ren in the throne room scene shortly after they both disposed of Snoke and his Praetorian Guards. There is nothing in those lines that state that Kylo says to Rey that her parents were nobody. She says it all herself. Unfortunately, many people have taken this scene a bit out of context as to who said what. Her parents may have been nobody important, but it wasn’t Kylo who told her so. This complaint is not as big of a deal as some of the others on this list. Nonetheless, it still should be addressed. The Force works in mysterious ways as we’ve come to know over the course of many Star Wars films. Rian Johnson gave us many different directions that have never been done before in a Star Wars movie. Throughout the movie, Rey and Kylo have an unusual connection through the Force. There are a few scenes in the movie that show the two of them conversing with each other while they both are trying to figure out how this is even taking place. Later, we come to find out that it was Snoke who manipulated both of their minds into believing whatever he wanted them to believe. 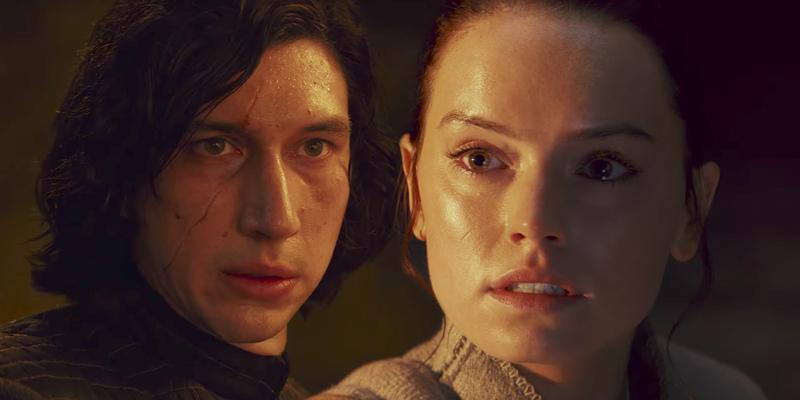 The scene in question comes at the very end of the film when somehow Kylo and Rey are still able to connect through the Force. But how are they able to do so without the aid of Snoke? The best answer I can give here is that they were only a few hundred yards away from each other. Not only that but since they’re already connected, who’s to say that they still can’t talk to each other via the Force? Did people forget that Leia, Luke, and Darth Vader all spoke to each other through the Force in The Empire Strikes Back? Leia heard Luke’s cries as he was hanging on for dear life at the bottom of Cloud City. On Luke’s ride back on the Falcon, Vader reaches out to Luke claiming it is his destiny to join him. Both of these examples prove that it is possible to talk through the Force no matter where you are in the universe. One major aspect of this story that took me and everyone else completely by surprise was Snoke’s untimely death. This character was hinted at in The Force Awakens as this strong and powerful mentor to Kylo Ren. Many fans believed that this character could have been the next Emperor Palpatine. But after that infamous throne room scene, Snoke’s character was all for nothing. At least that’s what we’re lead to believe. The Last Jedi’s major storyline did not involve Supreme Leader Snoke. While his presence was certainly felt, this trilogy isn’t about him. All we’ve learned from Snoke up until this point is that he manipulated Kylo Ren and brought him over to the dark side. Neither Han nor Leia could save him. Not even the mighty Luke Skywalker was able to save him. Snoke’s power in the Force was used heavily in this film. He connected the minds of two powerful Force users, took Kylo Ren under his wing, and threw Rey around like a rag doll. Though fans may be disappointed in the overall character of Snoke, his existence however cannot be overstated. He is crucial to Kylo Ren’s storyline and his death has only made Kylo stronger in the Force. Fans have also voiced their displeasure regarding Snoke’s character development. However, people need to realize and understand that Emperor Palpatine’s story wasn’t told in the original trilogy. As a matter of fact, Palpatine’s backstory and rise to power wasn’t fleshed out until the prequel trilogy. The original trilogy showed how powerful he was by utilizing his Force lightning on Luke. He was also one of the few individuals who could order Darth Vader around. This goes to show that The Last Jedi didn’t need to give us Snoke’s story. The film wasn’t about him. All we needed to see was how persuasive Snoke was and I believe Rian Johnson did just that. Kylo Ren is going to be even more powerful now after easily defeating his own Supreme Leader. The big topic from The Force Awakens was that people had issues with Rey beating Kylo Ren on Starkiller Base. May I remind everyone that Kylo was not trying to kill Rey because Supreme Leader Snoke said he wanted her alive. Kylo was also blasted in the abdomen by Chewbacca’s crossbow and began bleeding to death. Rey narrowly escaped her fate by fighting him long enough to be separated by the destruction of Starkiller Base. This is a topic that completely boggles my mind when I get into discussions with some big time Star Wars fans. There are many people out there who have a huge issue with Rey knowing all these Force abilities without having a single training lesson until she meets Luke Skywalker. How could Rey learn to control the mind of a Stormtrooper without being taught? How could Rey know how to wield a lightsaber without proper training? And how could Rey see into both the future and the past by simply touching Luke’s original lightsaber? The answer is actually very simple. You. don’t need any training to learn how to harness Force abilities. A great example of this is Luke Skywalker from A New Hope. Luke had very little training on the Millennium Falcon after meeting Obi-Wan and yet somehow is able to deflect shots from the Marksman-H combat remote. After a couple of failed attempts of firing the proton torpedoes in the thermal exhaust port, Luke decides to give it a try and does so by turning off his targeting computer. Somehow through the use of the Force, Luke is able to fire his proton torpedoes and guide them through a 2-meter wide thermal exhaust port straight into the heart of the Death Star. In The Empire Strikes Back while hanging upside down, Luke is able to call his lightsaber to his hand and take down the hungry Wampa. These examples just goes to show that a Jedi does not need the necessary training to be able to harness their powers. Sure Rey did some training with Luke on Ahch-To, but it wasn’t entirely essential for her to use her force abilities. She always had it in her. So that’s my list! Were there other topics that you strongly disagreed with that is not on my list? Please share your thoughts in the comment section below! regarding Rey’s parents, They may not have been her real parents. She may have been dropped off to a couple willing to raise a child like Luke’s Uncle or Senator Organa did in order to protect her.